I’ve been meaning to write this post for a long time. Like, a seriously long time. I think I first mentioned the idea to some friends on Facebook back in April. But I got sidetracked with a book release, and then I got sucked into the writing of a new novel, and so on and so forth. But today I finally submitted my self-produced Red Hot Steele audiobook to ACX for review, and so I figured it was a perfect time to finally write this. And so, without further ado, I give you: The Complete Guide to Home Audiobook Narration and Production. I think it’ll be a good reference to those of you at home hoping to narrate and produce your own audiobooks (and I bet I’ll refer to it on more than one occasion myself). One note before we get started: This guide should help you produce audiobooks for any vendor, but I’m specifically focused on producing audio for ACX (Amazon’s subsidiary that uploads to Amazon, Audible, and iTunes). ACX is really the only game in town for indie audio, so it makes sense to focus on them. OK, first things first. ACX has a series of five videos in which they discuss many of the basic elements of home audiobook production. I HIGHLY encourage you to watch them before you begin here. Seriously. I’ll wait. Ok. Are you done? Good. Now we can discuss some of the things they mentioned—specifically how to get audiobooks done cheaply and efficiently but professionally. And I’ll give you specific advice on mastering, which the folks at ACX don’t go into. Let me be blunt. If you don’t have a quiet room in your house that can act as a recording studio, you might as well not even try to record your own audio. This is the most important part of the entire process. If you record in a noisy room, your final product will sound terrible, no matter how hard you try to fix it. Luckily, many of us have one (and only one) room in our homes that can work. You see, the key to good audio recording is to do it in a ‘dead room.’ This simply means a room in which sounds don’t bounce around off walls and furniture and play havoc with the audio recorded by your microphone. While professional recording studios will line walls with noise-cancelling foam, it turns out clothing (which is mostly fabric and air) does much the same thing. 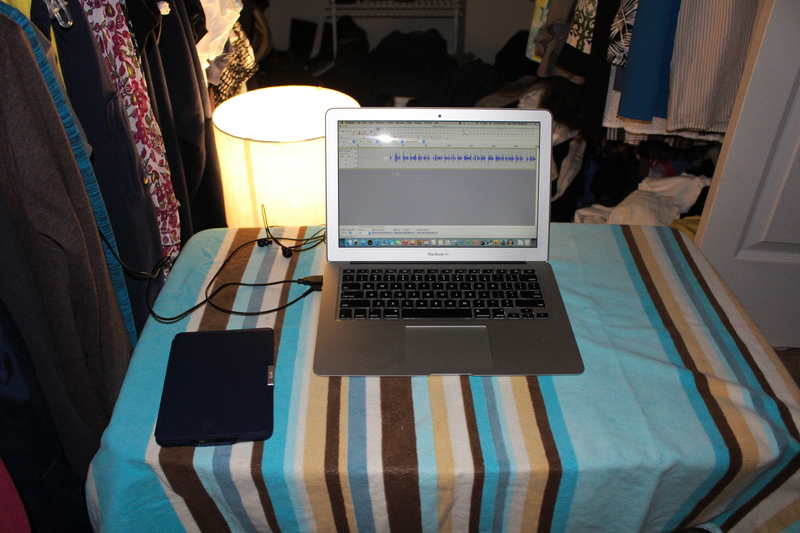 I’ve attached a photo of my own recording studio (ie. closet). As you can see, it’s filled with clothes—my wife’s, mostly, but this is how you want it. More clothes means more dampening material. And though you can’t see it, the door to the closet is to the right. When recording, make sure to close the door and drape a thick towel over it. Hard surfaces like doors reflect sound, and you want to avoid any echoes you might get from them. 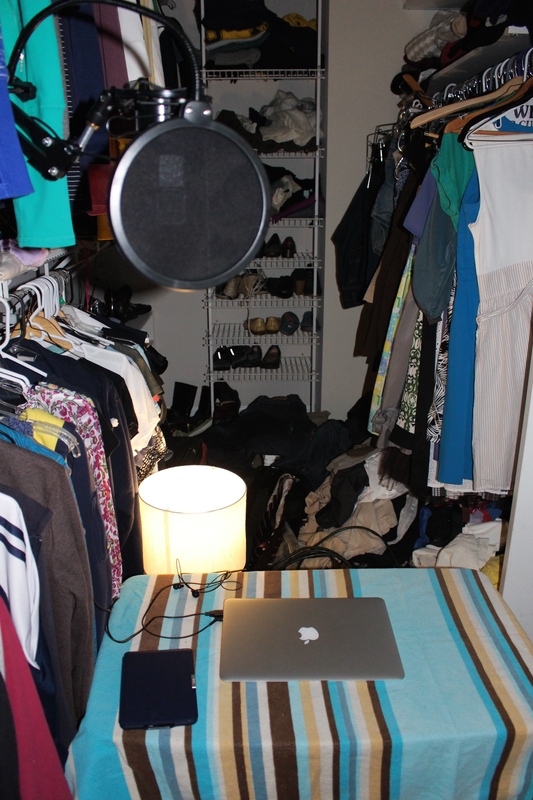 To see if your closet can work as a studio, you’ll have to try, and we’ll get to that. But first, I want to point out a few things you may have gleaned from the ACX videos. First, be aware of your surroundings as you record. If you can hear dogs barking, birds chirping, children playing, or loud trucks driving by when in the confines of your studio, chances are your microphone will detect those sounds too. Most of the time, you can simply pause your recording if you hear these things and start up again once they’re done. One thing you must check is to see if your closet has a vent for central heating/air. If it does, I highly recommend you turn it OFF (the entire system, not close the vent) for the length of your recording session. The sound of air forcing through a vent will show up on your recording, and it doesn’t sound good. And one more point: check to see what kind of lighting you have in your closet. Chances are there’s a fluorescent bulb in there. Those are terrible and make tons on noise. So just bring a small lamp in with you, and make sure to put an LED bulb in it, as LEDs are whisper quiet. The ACX guy lists a whole bunch of tools, computer equipment, and software that you should get to optimize your recordings, but quite honestly, the list is excessive, and you don’t need to spend a fraction of what he says you do to produce a quality finished product. My mic setup. I use the small (but excellent quality) Samson Go Mic. 1. A mic. I recommend a simple USB mic like the Blue Yeti, but even that might be more than is really needed. I use the compact but excellent Samson Go Mic, and it produces great quality sound. 2. 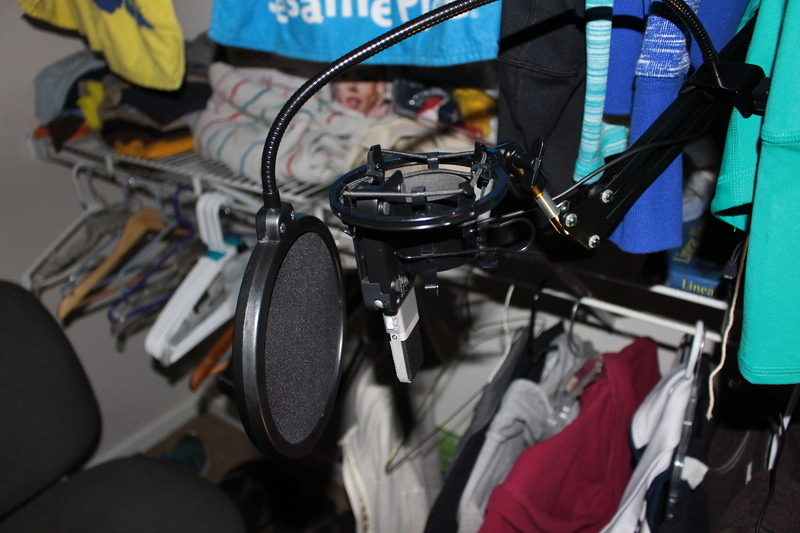 A pop filter and a mic stand. Yes, you really do want a pop filter as it noticeably improves sound quality on certain consonant sounds, and a mic stand is critical for optimum positioning. I use this filter and this stand. They’re not expensive. My computer, running Audacity, and my Kindle, which I use for my readings. 4. Headphones (in ear or over ear). You’ll need these connected to your computer to avoid having the computer use the standard speakers for output (which will mess up your recording). 5. Something to read your book from. The ACX guy recommends a script stand with a printed script, but you know what I found that I really like? I used my Kindle. It’s backlit, lightweight, and I can switch pages on it faster than I could on a mic stand anyway. 6. Audio recording software. Again, ACX guy says to use Pro Tools, and you could, but it’s expensive. Audacity, on the other hand, is free, it’s available on multiple operating systems, and it works like a charm. In the rest of this guide, I’ll assume you’re using Audacity. You’re now ready to start narrating and recording. First things first, you’ll have to familiarize yourself with Audacity. It’s pretty simple. Just play around with it some. You’ll learn more later at the editing and mastering stages. There are only a few things you really need to check at this stage, and I’ll refer you to the screenshot I’ve taken. The Audacity interface. Note the red numbers 1, 2, and 3. See that red number 1 in the lower left corner? Make sure it is set to 44100 Hz. This is the recording rate you’ll want. See the number 2 at the top right? Make sure you’ve selected the mic you’ve attached via USB, and make sure you’re recording in MONO. Also make sure your headphones are selected. See the 3 in the top middle? Click on that section to monitor the background noise in your studio. Ideally, you should be at -60dB, but if you’re close, don’t fret. I find that if you’re below -52dB or so, you’ll have no problem editing the background noise out in post processing. That’s it. You’re ready to record. Just be sure to leave ~20 seconds of silence at the beginning of each chapter you record (you’ll need this for noise reduction purposes later). Now, let’s talk narration. This is actually one of the hardest parts of the process, as you may not be experienced as a narrator. But you are familiar with your own work, which is a big plus. Here’s my advice: Practice, practice, practice. Speak to yourself in a quiet room, at least until you can recite multiple lines of your own work in a row without stutters, stammers, or ums. Don’t worry about flubs during the recording. Just start over at the beginning of a sentence, and keep going. And stay hydrated. A well-lubricated throat is key to precise pronunciation. A note on character voices: They are essential components of audiobooks, as they give the listener cues as to who is speaking. I can’t give you any advice here other than practice them often, and listen to your own work to make sure they are consistent and unobtrusive (ie. not annoying). Finally, one last piece of advice. READ SLOWLY. Way slower than you think you should be reading. It takes a lot longer to absorb auditory information than it does to absorb the written word. Go too fast, and your finished product will come across as a blur. Trust me. I had to re-narrate my entire first attempt at Red Hot Steele because I read too fast. We’ve made it to the last step, which is arguably the trickiest. Editing is simple, but extremely time-consuming and tedious (you’ve been warned!). Mastering is tricky because you probably don’t have any idea how to do it, and it’s easy to mess us the finished product if you’re not careful. Now, I’m going to say something that will probably make audio engineers cringe, but I like to do the mastering before I do the editing. Why? Because if you edit first and master later, you’ll end up amplifying all sorts of weird, breathy mouth noises and have to go back and edit those out later. So save yourself time and do the mastering first. Mastering for audiobooks is comprised of (at minimum) three basic steps: noise reduction, compression, and normalization. Noise reduction removes the background noise from your audio recording (assuming the noise floor is already low). Compression reduces the dynamic range of the audio, so that the loud parts are quieter and the quiet parts are louder. This makes for a more uniform listening experience and makes it so the listener doesn’t have to play with the volume knob often. Normalization limits the maximum loudness or amplitude of a track. Select ~10 seconds of silence at the beginning of the audio recording. Click on Effect > Noise Removal and click on Get Noise Profile. Hit Ok. Select the entire audio recording. Click on Effect > Noise Removal and click Ok. Select the entire audio recording and click on Effect > Compressor. Select the entire audio recording and click on Effect > Compress Dynamics (must have optional plug-in, Chris’s Dynamic Compressor, installed. Download it here). Select the entire audio recording and click on Effect > Normalize. Check normalize maximum amplitude and input -3.0 dB. Once done, you can check the RMS volume of your audio track. Select your entire recording, click on Analyze > Contrast, and then click Measure selection (foreground or background, won’t matter in this case). For ACX, your audiobook track should be between -23dB and -18 dB. If it isn’t, click on Effect > Amplify and play with the values until your track is in the right range. If there are any wonky spots that are too loud (you’ll see them on the spectrum if they’re there), select them and decrease their volume using the Amplify tool. Then, select all and renormalize. If you find any spots in your recording that are too quiet, just select them and amplify them individually. If you’ve gotten this far, that means you’re ready for the editing. It’s simple, really. Just go through your entire recording, deleting bad takes and flubs, silencing any weird mouth sounds or background noise that made it through your noise reduction step, trimming or lengthening pauses between phrases (if necessary), and playing with volume (again, if necessary). I congratulate you if you’ve made it this far, and hopefully everything I’ve collected here will be of use to you in creating your own audiobooks. But there’s a few final points I wanted to add that didn’t fit in anywhere else, most of them specific to ACX requirements. Remember to record each track in MONO format at 44.1 kHz. Record separate opening and closing credits (see this ACX page for more information). At the beginning of each track, record a chapter header after your initial ~20 second pause, and be sure to leave some room tone (0.5-1.0s at start, 1.0-5.0s at end) in your final finished product. Export to MP3 format at 192kps, Constant Bit Rate (CBR) in MONO (as long as you record in MONO, Audacity should export in MONO). Be sure to give all your finished MP3 files a proof listen. Chances are, there will be a few mistakes you’ll have overlooked. From a technical standpoint, any laptop or tablet should work as long as you can get audio recording software onto it that suits your needs. I use Audacity, which is free, but to my knowledge it’s only available for Mac, Windows, and Linux, so I’m not sure if you could use it on your android-based tablet. There might be apps in the android store that are perfect for this, but I’m unfortunately unfamiliar with what they might be. One of the BEST articles I found in my search for recording an audio book at home. LOVE the recording studio! So concise and detailed! Thanks for writing! I’m really hoping some engineer will chime in and explain why they say Edit THEN Master because it makes no sense to me. Why would I want to increase the volume on pops and clicks I never heard in my initial edit?? Thanks for the clarity in your steps. Exactly what I’ve been looking for. You’re welcome! But yeah…I don’t understand the traditional ‘edit then master’ mantra. It’s easy! You want to master one time, this pervents loss of quality. Also mastering is the process of making it listing freindley. The whole point is to remove the bad takes first THEN run your filters to make it sound great. Thank you- finally an explanation I can understand! Thank you for writing this! I was so lost on how to get my audio within the required decibel range but the mastering step cleared it right up for me. Super helpful! This was extremely helpful! But even after following everything you listed, I still had to use fre:ac to convert the file to an acceptable format before I uploaded. Is this something you also had to do, just didn’t write down above, or did I miss something? I was able to convert the files to MP3 format from within Audacity, but there might be a free plugin that is required to make the conversion. Honestly, it’s been a long time since I set it up, so I don’t remember. Sorry! This is a great artical I just have one thing to say.